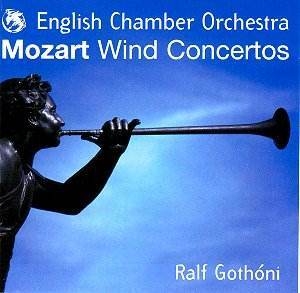 Concertos for Wind: Clarinet Concerto in A, K622 (1791) [29�19). Sinfonia concertante in E flat, K297b (1778) [30�05]. Oboe Concerto in C, K314/285d (1778) [20�11]. Bassoon Concerto in B flat, K191/186e (1774) [18�00]. Horn Concerto No. 4 in E flat, K495 (1787) [14�57]. Anthony Pike (clarinet); John Anderson (oboe); Richard Berry (K495), John Thurgood (K297b) (horns); Julie Price (bassoon); English Chamber Orchestra/Ralf Gothóni. Rec. Gateway Studios, Kingston upon Thames in February 2002 (K622), St Paul�s Church, London, N1 in May 2000. A useful selection of concertos from Mozart�s pen. How nice to hear the oboe and bassoon concertos, so rarely aired in concert halls of today. The wind Sinfonia concertante (as opposed to the far more famous one for violin and viola) is pure delight, as this performance reminds us. The unifying factor in this set is the excellence of the accompaniments. Finnish conductor Ralf Gothóni became Principal Conductor of the ECO in 2000. Clearly the orchestra holds him in high esteem, for the playing in unfailingly sensitive throughout. All soloists hail from the ranks of the ECO (the two hornists are the orchestra�s co-principals). Of course competition is fierce in this field. The clarinet concerto, for example, receives first-rate advocacy from Michael Collins (on basset horn) with Pletnev and the RNO on DG 457 652-2, and of course Jack Brymer is (in my humble opinion) unparalleled in this work (try Philips Solo 442 390-2, conducted by Colin Davis and where he couples the concerto with the Clarinet Quintet, or perhaps even better EMI GROC 567 596-2, an earlier recording with Beecham, coupled with Symphony No. 41 and the Bassoon Concerto). Anthony Pike, who joined the ECO way back in 1989, is however perfectly fine in the present context of a wind conspectus. This is a middle-of-the-road interpretation, the slow movement old-school slow but lyrical, the finale jolly enough. It is fun, but just not inspired. The second work on the first disc is the magnificent Sinfonia concertante for Wind, a magnificent and woefully neglected work. Instead of the autumnal maturity of the Clarinet Concerto it breathes an outdoor vitality redolent of the serenade. It is exuberant, linking the height of civility (especially in the finale) with suavité and barely concealed joy. All soloists on this occasion are virtuosi in their own right and, perhaps more importantly, seem to revel in the chamber-music atmosphere of it all. Balances in the beautiful slow movement are exemplary. This is the highlight of the set. The Oboe Concerto is a delight. A pity the acoustic seems too large and overly reverberant. John Anderson�s contributions to the Sinfonia concertante were marvellously appealing, so it is a treat to hear him shine on his own. His tone is very appealing (un-acidic), his account of the slow movement sensitive in the extreme (including a simply lovely cadenza of his own making).. Anderson�s way with the throw-away ornaments of the theme of the finale could hardly be bettered. If this set has an Achilles heel, it comes in the form of the Bassoon Concerto. Julie Price plays well, but is sometimes a little under-projected. Yet there I much to admire � again, a lovely cadenza, and she integrates the wide thematic leaps in the slow movement perfectly convincingly. Room only for one of the four horn concerti. Competition is perhaps steepest in this work out of all the featured concerti (will anyone ever supplant Brain and the Philharmonia? ; or if you want the natural way, try Baumann). Yet Richard Berry has his own way, and very appealing it is. His tone is creamy and confident (in fact authoritative), and he can be sensitive when required. Nice to finish the listening session off with the most famous Mozart concerto movement of them all. It is evident great fun was had by all. Retailing at budget price, this is well worth snapping up. Authenticists might not agree with everything, but surely even they would get sucked in to the spirit of it all.